In the late 1950s and early 1960s, Cold War tensions and threat of nuclear war convinced government leaders in the United States that millions of lives could be saved by the construction of home fallout shelters. The idea took a while to take hold. Even though public drills in the event of a nuclear attack was routine in the 1950s, the Eisenhower administration did not actively promote the construction of home fallout shelters. That changed with the 1957 publication of the Gaither Report, which backed the building of shelters that "permit people to come out of the shelters and survive." The change came after John Kennedy became president. Against the backdrop of escalating tensions with the Soviet Union, Kennedy urged Americans to build bomb shelters in a speech he delivered on Oct. 6, 1961. "We owe that kind of insurance to our families and to our country. ... The time to start is now. In the coming months, I hope to let every citizen know what steps he can take without delay to protect his family in case of attack. I know you would not want to do less." Kennedy also pressed Congress to allocate more than $100 million to build a network of public fallout shelters. 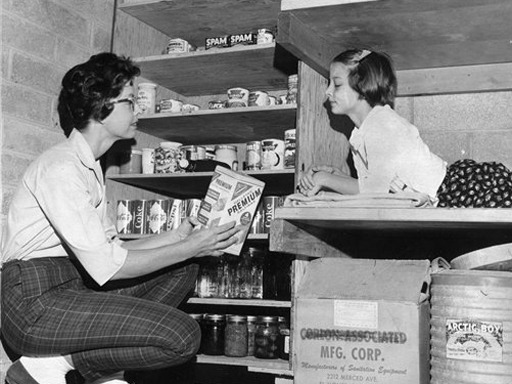 Congress responded by voting for $169 million to mark and stock fallout shelters in public and private buildings. In short order, the media picked up the message. For instnace, January 12, 1962 cover story of Life magazine was given over to a story about "The Drive for Mass Shelters" with the tease, "New Facts You Must Know About Fallout." "New from plywood research! Two effective family fallout shelters, well within the means and ability of the average homeowner to build. Fully approved by the Dept. of Defense. Both call for simple, economical construction with big panels of waterproof plywood combined with concrete block (Basement Shelter) or sand or gravel fill (Above-Ground Shelter.) Strong, safe, dependable, durable. Sent 25c and coupon below for booklet with plans and information:"
As the `60s gave way to the `70s and the fear of nuclear war receded in the age of detente, fallout shelters soon went the way of the hula hoop, relegated to the status of a cultural relic. In case you weren't around for that era - or even if you were but need a reminder of what fallout fever looked like - take a look at the accompanying photo gallery.